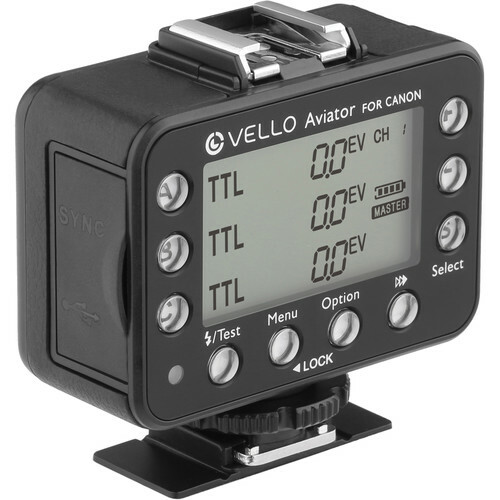 The Vello Aviator gives you control of 3 groups of Canon E-TTL or Nikon i-TTL flashes at ranges up to 300 feet. Correction: A previous version of this article inaccurately stated that Vello is an in-house brand of B&H. Vello is in fact a property of Gradus Group, which is a separate company (though both Gradus and B&H are owned by the same people). B&H, the New York photographic superstore, has started selling a new range of TTL flash triggers for Canon and Nikon. 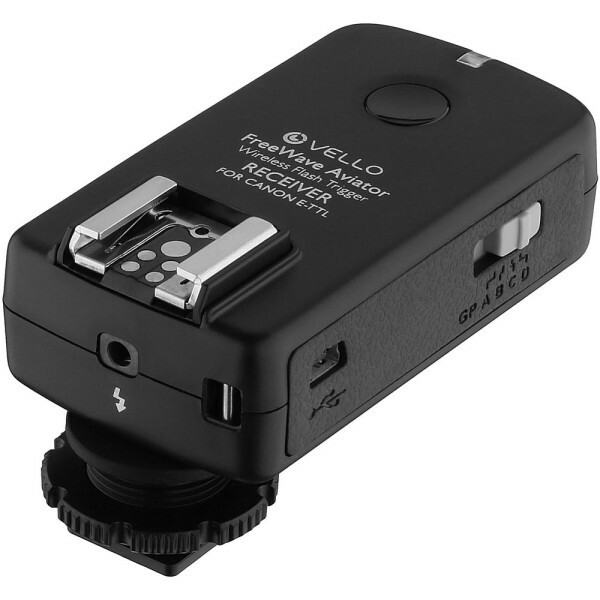 The Vello FreeWave Aviator system comprises large-screened transceivers and low-profile dedicated receivers, designed to clip onto your DSLR and shoe-mount flashguns. Using these triggers you can use full Canon E-TTL or Nikon i-TTL with your flashes at ranges up to 300 feet, by way of 2.4GHz radio signals. Features include high-speed sync (up to 1/8000 second), second curtain sync, remote zoom control and manual or TTL flash mode with +/-3EV flash exposure compensation, adjustable in 1/3-EV increments. The Vello Aviator transceiver has a large LCD screen to help you set up your three groups of flashes, and a hotshoe on top that you can use for TTL-pass-through, or for syncing a remote flash if the transceiver is switched into receiver mode. It even includes a battery level indicator. The dedicated receivers are smaller and cheaper, with sliding group selection switches instead of screens, plus lanyard holes, tripod mounting sockets and 3.5mm sync ports. Both modules are powered by a pair of AA batteries and also feature micro-USB ports for firmware updates. The most die-hard readers of this web site might recognise the Vello FreeWave Aviator as the return of the Rikon Dazzne Kody TTL, which first emerged over two years ago but never had very wide distribution. You can read our original news article and full review of the Kody TTL system from 2013. Since then this product has apparently meandered its way on to the market, and is now under the Vello brand. The Dazzne brand has since switched over to sports cameras. These triggers are similar in form factor to the Pixel King Pro system, but the taller transmitter unit could make stacking flashes on top of it slightly unstable. Read a discussion of this in our review of the Kody TTL version. One of the criticisms of the Kody was that it offers TTL exposure compensation in 1/3-stop increments, but manual power control is in whole stops only. It is not clear whether the Vello Aviator has changed this. Vello FreeWave Aviator transceiver units are priced $189.95 and receivers are $118.95 each (for both Canon and Nikon). Various bundles are available depending on whether you want multiple transceivers or one transceiver and several receivers. A 1 TX + 2 RX kit is $399.95. For more information, visit B&H or the Vello web site.